My story Milagroso came out on Tor.com last month. 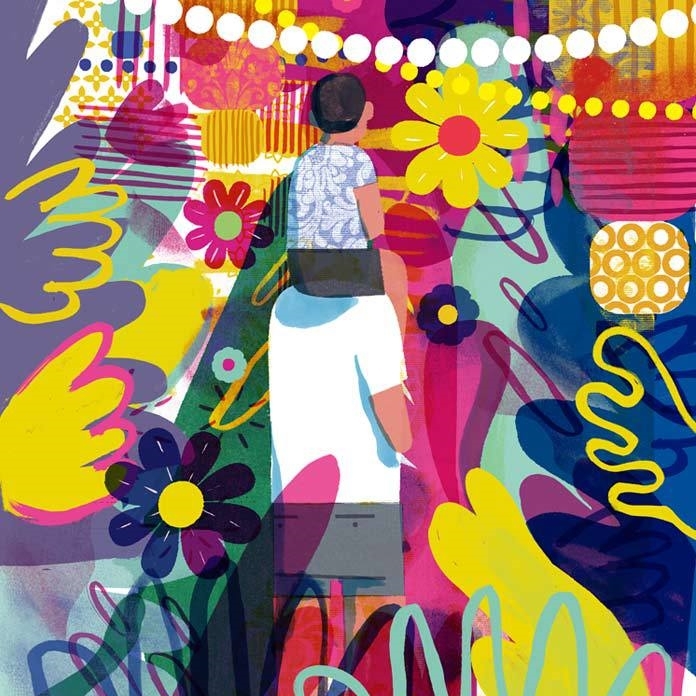 (Check out the beautiful cover art by Keith Negley!) It's a near-future science-fiction fantasy about food, faith, and revisiting one's home. This story had a pretty interesting journey, so I wanted to share some things I learned while writing/subbing it, in case it helps anyone else. 1. If you believe in your story, don’t stop sending it out. Even with this positive self-assessment, it received seven rejections. There were a few form rejections, and some kind personal rejections. These told me that aspects of the story were working for some readers, but after a while I started to wonder if it would work as well as it needed to for anyone to say yes. Despite my initial confidence, I considered shelving it after the third or fourth no. What kept me sending it out was the fact that when I reread it, I found I still liked it – I still believed that it deserved to be shared. Although there were gaps between my resubmissions, I didn’t give up on the story. That’s not true for everything I’ve written. Sometimes I reread a story and find that it’s not quite working for me anymore, or there are some bigger edits I need to tackle before I can send it out again. So I don’t mean that you should never shelve stories, but that sometimes a gut-check is very useful: if your gut says hey, I still think this is working as I’d hoped, then listen to it. It's really, really common to get several rejections for a story before an acceptance. Find Me received six rejections in total, and The Oiran's Song received three (it's a novelette, so it had fewer potential markets). 2. It’s all right to go back to an earlier draft if it’s closer to the story you want to tell. I read the personal rejections carefully, and considered the comments the editors provided. After thinking on it, I used some of the feedback to improve the story. When I revise, I keep in mind Karen Joy Fowler’s advice: “Is the revision making you happy? Good, then it’s working. If not, stop.” At the time, I seriously thought the revisions were doing good! My original 4400 word draft expanded into 5300 words, in an effort to make the ending feel more “earned,” and to clarify the motivations. I sent this version out, and got a rejection about how it felt too long for the story it was telling. I reread it and went “Oh my god, they’re right!” and pared it down to 4000 words, cutting out all the fat. And then I put the story in a metaphorical drawer and gave it time to breathe. When I reread my latest draft a month or so later, I found it toneless and dead. In paring it down to its bare minimum, I’d stripped the sentences of what made them shine. And while there are many darlings I’ll kill in order to tell a story better, I bitterly realized that I’d killed far too many this time. So I reread the original draft I’d written – and decided that it was the one that worked best. I tweaked it slightly with some sentence-level improvements I’d made during the revision rounds, then sent it to a new reader to test my theory. (Thanks, Sunny!) The response I got was positive, so I submitted it again. After two more rejections, I finally got a yes. 3. Don’t be afraid to use your own culture in your story. One of the driving ideas behind my writing Milagroso was the fact that I wanted to write a “very, very Filipino story.” My week 1 story at Clarion had taken place in many different cities and I didn’t make it a point to spell out the cultural backgrounds of my characters. I decided that for my week 2 story I’d deliver what was missing in that first story – a very grounded setting and characters. I’d make them unmistakably Pinoy. This decision coincided perfectly with Nalo Hopkinson as our week 2 instructor – I had so many things I wanted to ask her about writing as a queer woman of color. A surprising comment I received in class was that I shouldn’t italicize the foreign words I used: like hija, and manong, and kiping. If a publication wanted me to do that, then I could consider it, but I didn’t need to do that in the manuscripts I turned in. “Easier for who?” Nalo, and my class, asked. Consider the word empanada – for some readers that should be italicized, for some readers not. It just depends on what you’re used to. There’s no need to highlight the words you’re writing and the language you’re using – because it all depends on the readers’ contexts. You don’t need to call attention to these words – just let them be, like any of the other words in the text. It's also worth asking: why does it need to be easier? Don't you want readers willing to challenge themselves? During my last round of revisions, I upped the amount of local words I used. It was reading Zen Cho’s Spirits Abroad that gave me that courage – I loved how her sentences reflected the Malaysian characters’ speech, and if I loved that as a reader, then surely others could appreciate it if I made my sentences "even more Filipino." Which sounds weird, because anything I write will be colored by me-being-a-Filipino-writer - but it is a choice I face in my writing, and must consider as I continue creating stories. Note: I don’t actually mind if a venue wants me to italicize foreign words – it’s what I was used to, and in many English-language Philippine publications we do the same. (I am admittedly an italicization lover and use it liberally. Especially for that sweet sweet stream of consciousness.) Still, it was surprisingly freeing not to have to use them anymore, and now I don’t draft or submit manuscripts with italics for foreign words.